Described as the ‘treasure trove’ of Indian music the NCPA Archives has over 5000 hours of music of the ‘who’s who’ of classical music both in the Hindustani and carnatic styles. Maintained for over 4 decades in the most ideal conditions of temperature and humidity, and on the best recording formats the NCPA archives preserves and protects India rich musical heritage. According to the artists themselves the work recorded on the Archives feature some of their best works recorded at the prime of their careers. This wonderful ‘Khazana’ is being presented to the music loving public for the first time. Born .n 1929, Girija Dev is a living legend, and one of the few remaining maestros of the Purab Ang Gayaki tradition of the Banares Gharana. Allhough renowned and revered 3S the 'Queen 01 the Thurn i', she is equally at home with both the traditional 18th Century style of classical Khayal singing, as well as the poetic semi-classical Myles like the Thumri, Tappa. Kajr-i, Dadra and Chaiti. It was her father Ramdev Rai who inculcated a deep love for classical music in his daughter. At the tender age of five, Girija Devi began taking music lessons from teachers like sarangi player Pandit Sarju Prasad and Pundit Shrichand Mishra. 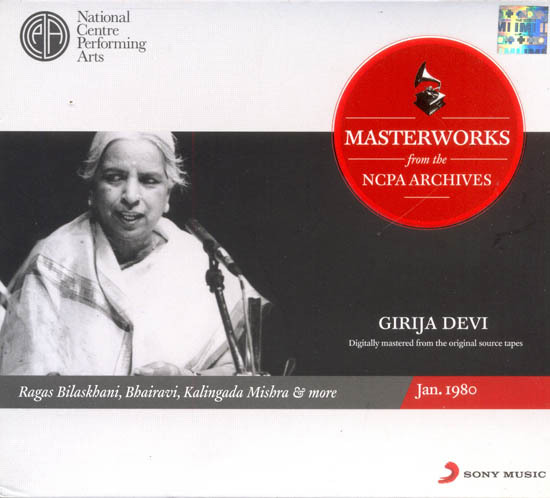 Girija Devi's very first music recital took place in the year 1949 from the Allahabad branch of the All India Radio. Her brilliant renderings of light classical music went on to capture audiences' hearts worldwide. Girija Devi is also an accomplished composer, and has composed several bandishes and thumris. Girija Dcvi's Khayal repertoire is centered around popular ragas, and she expounds these ragas with detailed attention to the subtleties of the Raga grammar. Her light classical renditions follow the same approach. Despite having the license to explore and improvise, her Thumris and Tappas an: firmly grounded on the traditional style of Raga development. The melodic progression in her light classical pieces is akin to the alap in a Khayal, with clearly defined sthayi and antara sections, within which she weaves a brilliant interplay of poetic, melodic and rhythmic elements. In her renditions of Tappas - a fast-paced genre of semi-classical music, despite the total architectural freedom available in the genre, she adopts a steady ascent and progression in her rendition. Graceful melodic contours enhanced by elongated notes (meend) are used to communicate the musical essence of the piece.